A Cupcake Love Affair: Luck o' the Irish Month o' Cupcakes #1 - Green Velvet! Luck o' the Irish Month o' Cupcakes #1 - Green Velvet! 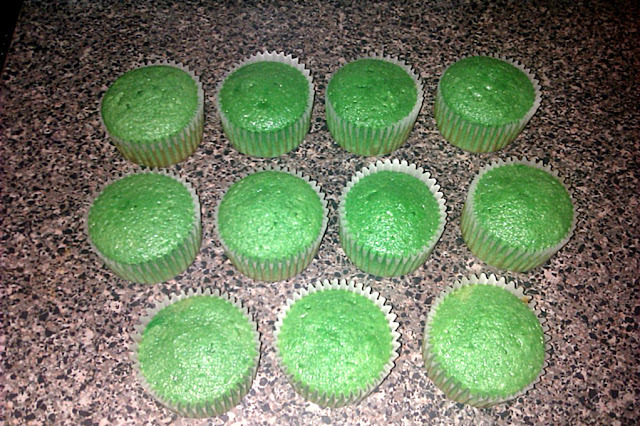 Can someone please explain to me why, 5 days before St. Patty's Day, I couldn't find cupcake liners or sprinkles to go with the theme anywhere?? I looked at Publix, Sweetbay, Target, and Walmart. Today I went to Michaels (where I probably should've started in the first place) and finally found some. Even Michaels was almost out so I stocked up for next year! 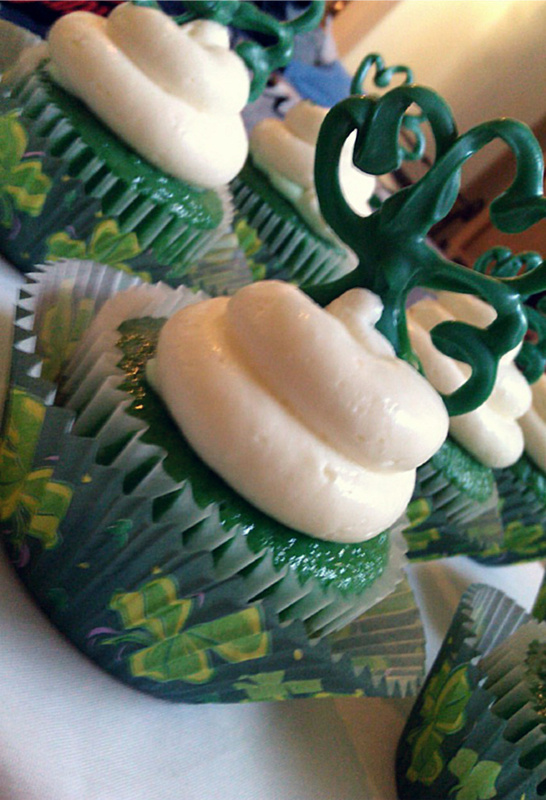 So, here it is - the best red velvet cake recipe I have ever tried, adapted for St. Patty's Day and made into a slightly healthier version of the original. 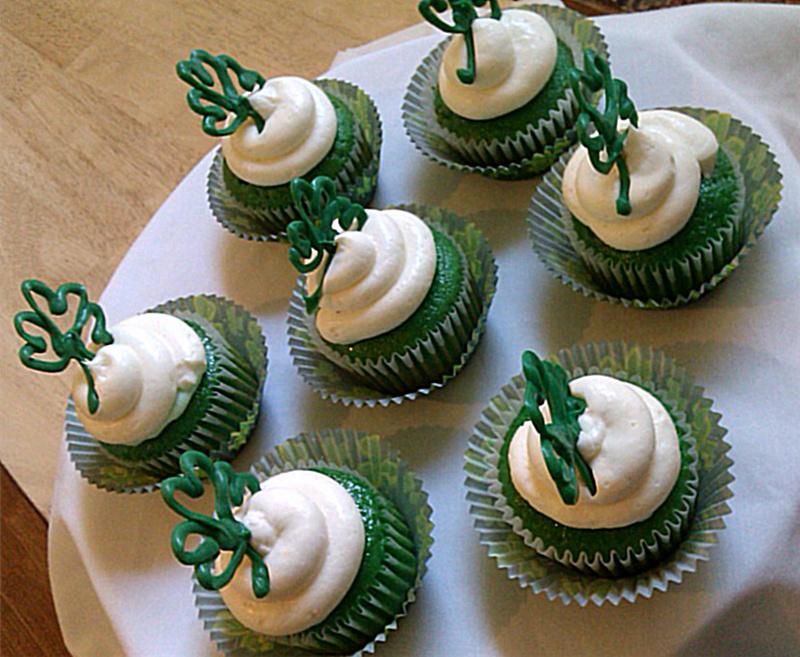 I filled the cupcakes with a light green cream cheese filling and iced them with a FABULOUS whipped cream cheese icing - best ever! Then I freehand piped some 3 leaf clovers with white chocolate (dyed green, of course) and voila! 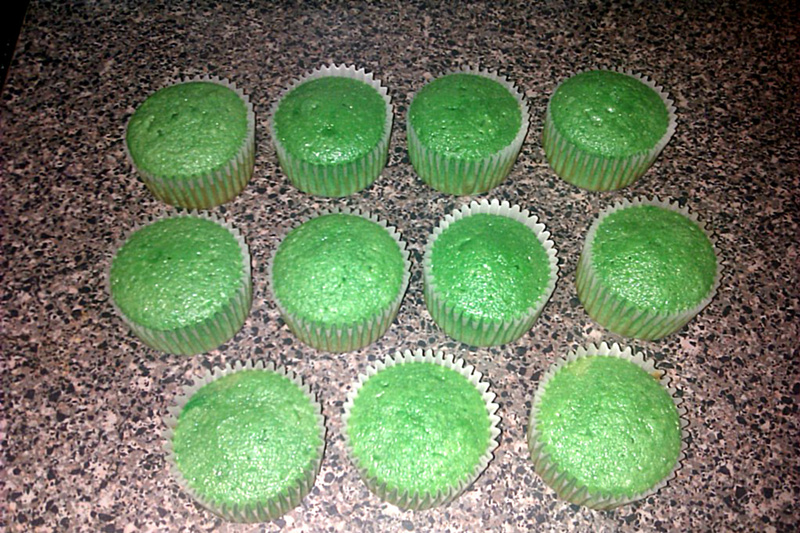 Green Velvet Cupcakes for St. Patty's Day! In a mixing bowl, cream the sugar and butter, beat until light and fluffy. Add the eggs one at a time and mix well after each addition. Mix cocoa and food coloring together and then add to sugar mixture; mix well. Sift together flour and salt. Add flour mixture to the creamed mixture alternately with buttermilk. Blend in vanilla. In a small bowl, combine baking soda and vinegar and add to mixture. 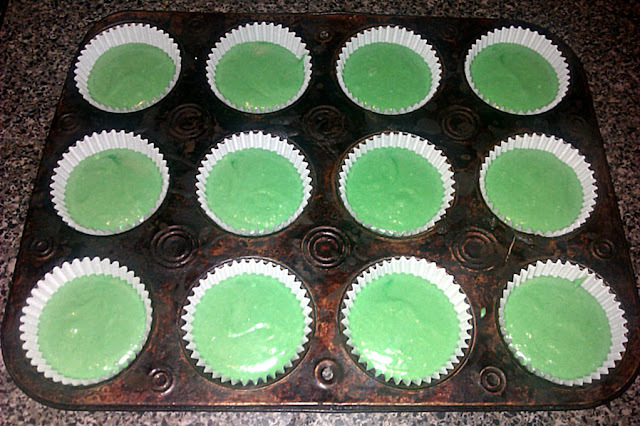 Pour batter into cupcake liners and bake until wooden skewer inserted into middle of cupcakes comes out clean. Cool before frosting. 1 cup heavy cream, cold. Beat the cheese, sugar and vanilla until smooth and fluffy. In a separate bowl, beat the heavy cream to nearly stiff peaks, then add the whipped cream into the cheese mixture and quickly and briefly beat to combine. Do not over beat. 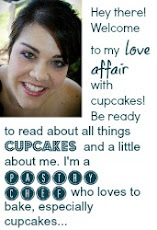 As always, happy reading and, most importantly, happy cupcake-ing!! Those look awesome. I'd really love to eat one right this second. Thanks for sharing at Shine on Fridays!! Thanks, Amy! 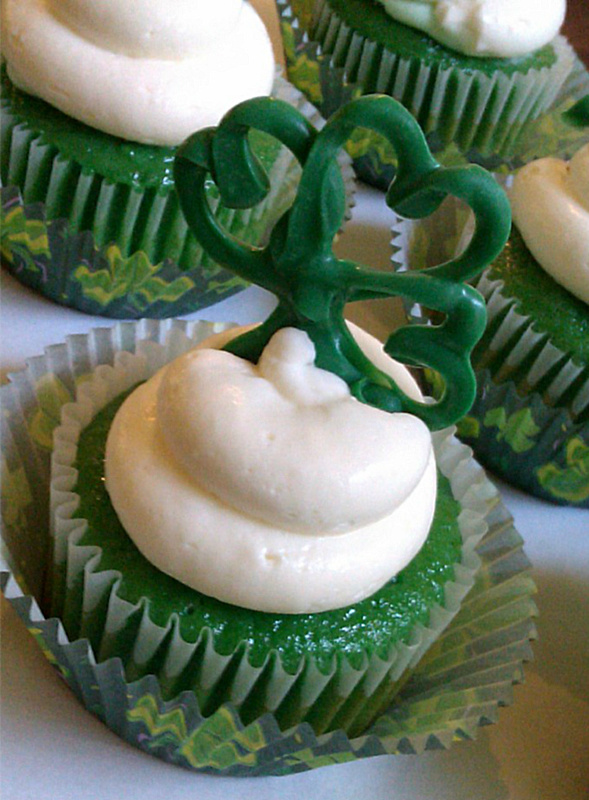 I really enjoyed making these and love how the three leaf clovers turned out! Those cupcakes look fabulous. I host a weekly Anything Goes Linky every Friday-Monday please come share. I absolutely adore cupcakes. They're my happy food to bake! Just found you through the Mingle with us bloghop and I can't wait to read more! Hope you come visit! Thank you! These cupcakes were so fun (what cupcakes aren't?) and I love the blog hop! Oh my goodness,...those look amazing. 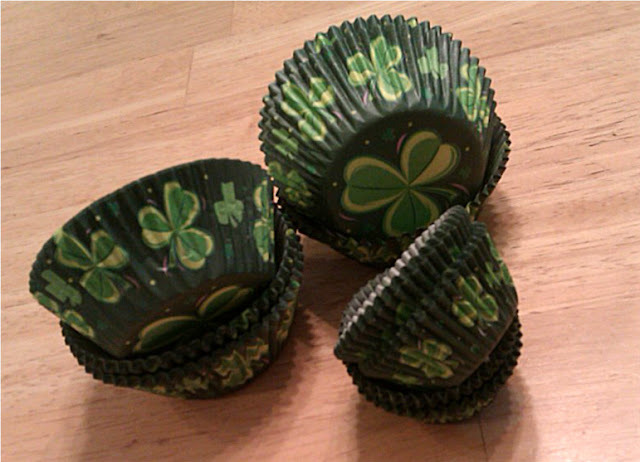 Love the little cupcake liners too. Thanks so much for sharing at our party this week. Thank you, Terry, for featuring me on your Facebook page! You did such a cute job... these are so fun. Thanks for linking them up to Pomp Party this week. Green! That's a genius! These are so great! Thanks for linking to Foodie Friday! Please come back this week. Hello! I could have sworn I've visited this site before but after browsing through a few of the articles I realized it's new to me. Hey friends! Thanks for taking the time to leave a comment. Reading them makes me happy! If you're a no-reply comment-er, please change this on your blogger. I make every effort to respond but sometimes can't get over here to post a reply. It's easier for me to hit reply on my email and immediately let you know that I appreciate your support and encouragement. Thanks much! Cupcake This & That...Oh, and These Too! Sweet + Sour + Strawberries = Success! Design by Sarah Yoder - 2012 - www.lifeonwalnutstreet.blogspot.com. Ethereal theme. Powered by Blogger.